We do have news for you: From now on the award-winning Kulo gaming headsets will be shipped with a new set of earpads – the Velvet Donut earpads. Equipped with both the popular Memory+ earpads and this new model ROCCAT™ is giving gamers a new option for customization. The new donut-shaped earpads feature an ultra-soft fabric that provides high comfort even after hours of gaming. Players who like a softer feel will prefer the Velvet Donut model. And because the new earpads don’t fit as snugly, passive ambient noise reduction is less than with the Memory+ model. In addition, the new earpads allow more air to reach the ears, which gamers in warmer countries will appreciate. What’s more, ROCCAT™ will send the new Velvet Donut earpads free of charge to any customer who bought a Kulo headset before their introduction. Customers simply have to register online at roccat.org using their ROCCAT ID number and product serial number to receive the new pads. 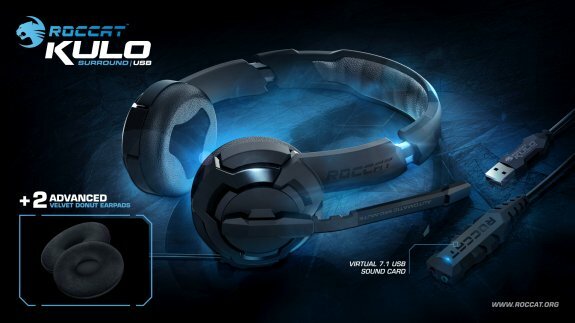 The ROCCAT Kulo Virtual 7.1 USB Gaming Headset offers thrilling virtual 7.1 surround sound, providing gamers with incredibly detailed audio that gives them a more immersive experience -- as well as a huge tactical advantage. The ROCCAT Kulo Stereo Gaming Headset features premium stereo sound packed into a lightweight, flexible and robust design. Both headsets deliver a combination of incredible comfort and high-end stereo headset technology.